Nottingham City UNISON has been in negotiation with Framework Housing Association, one of the largest providers of supported housing and homelessness prevention in the city, who have become the first organisation in Nottingham to sign up to UNISON's 'End Violence at Work charter'. Violence at work, especially in vital front-line services, is a very real issue and Framework has agreed to work with UNISON to ensure the organisation implements measures to reduce the risk of violence and assault towards its workforce as far as is practical and possible. Framework has already embedded the 10 standards of the charter into their Violence & Aggression at Work policy and will monitor and liaise with UNISON reps during the regular Staff Council meetings. This is a very welcome commitment to staff safety and wellbeing and a clear messge to staff, stakeholders and service users that violence is not part of the job and Framework are serious about protecting the people they are responsible for as they carry out their work. Hopefully Framework will have set the standard and be the first of many employers and organisations across the city to make the commitment to sign up to supporting the campaign to end violence at work. 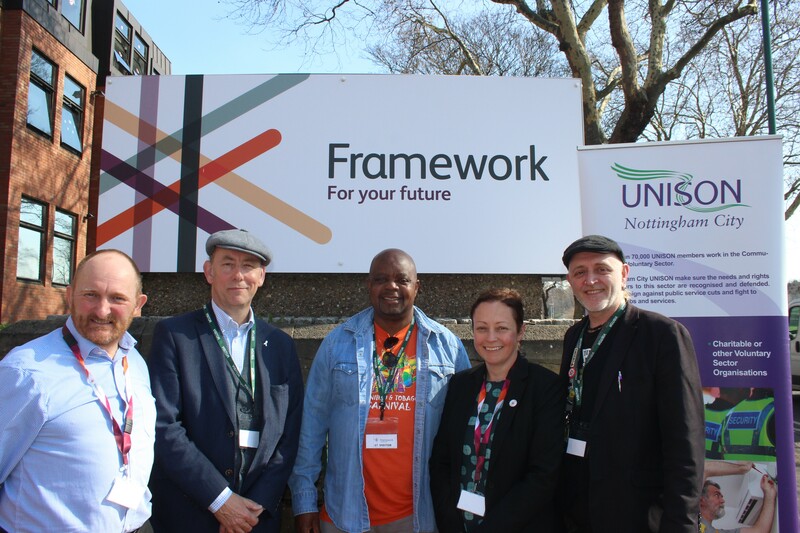 Pictured are Stephen Acklam (Framework Head of HR), Mick Moreton (UNISON Branch Organiser), Matthew West (UNISON Branch Organiser), Francis Mutero (Nottingham City UNISON member and Framework Support Worker) and Claire Hardwick (Framework Corporate Services Director). Expressions of interest for delegates to attend the National Delegate and Local Government Conferences in Liverpool in June.Please note the closing date for nominations and expressions of interest in attending the conferences is Monday 11 February 2019. It would be great if you could come along to one of the meetings. Following our success on the increment Freeze Claim, the Council has yet again attempted to blame our members, threatening job losses and cuts to services. Nottingham City UNISON Branch today was informed that the Supreme Court has refused NCCs application to appeal the decision of the Court of Appeal. This is fantastic news for our members who submitted claims and the case will now be remitted back to the tribunal to consider remedy. This is a massive victory that shows the value of trade union membership.